What makes a monster, and what makes a man? Set in Paris, 1482, a band of traveling players arrives to bring the story of The Hunchback of Notre Dame to another audience. The deformed bell-ringer Quasimodo longs for just one day outside the walls of the legendary cathedral, but his master, the righteous Claude Frollo, is determined to shield him from the outside world. When Quasimodo unexpectedly crosses paths with Esmeralda, a gypsy and an outcast herself, he begins to realize there is more to the world, and to the people in it. When fear and judgment threaten the city and the friends he has come to love, Quasimodo must choose whom to trust – and what he is willing to risk for freedom. 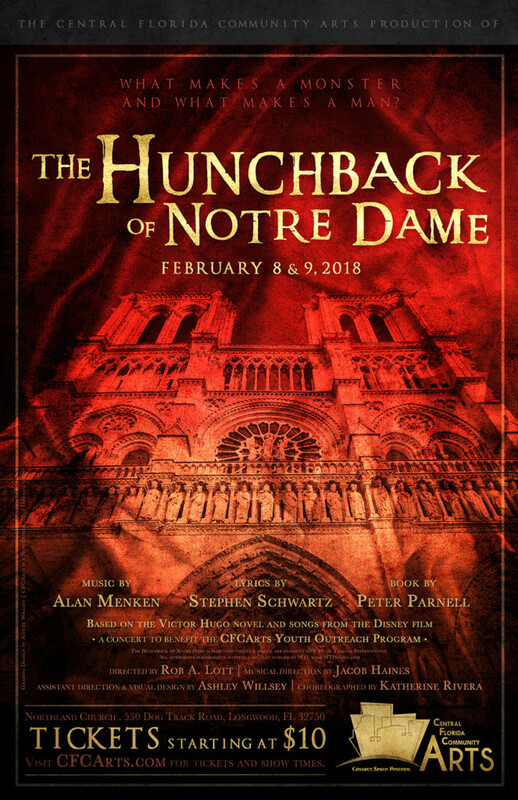 Based on the 1831 novel by Victor Hugo and the 1996 film of the same name, The Hunchback of Notre Dame bursts into life onstage, framed by the incomparable music and lyrics of Academy Award-winners Alan Menken and Stephen Schwartz. Featuring memorable songs including “Out There,” “The Bells of Notre Dame,” and “God Help The Outcasts,” this vibrant musical returns to Hugo’s original material in a hard look at humankind, and shines a light into the dark truths of the world. The Hunchback of Notre Dame will be held Thursday, February 8 and Friday, February 9, 2018 at 7:30 p.m. at Northland Church, 530 Dog Track Rd., Longwood, FL 32750. We are offering the convenience of assigned seating for this event! That’s right, you will be able to CHOOSE YOUR SEATS when you order your tickets. All seats in the auditorium will be assigned and will not be first come, first served. So buy your tickets now! Tickets are $10 each for Advance General seating, $15 Prime Seating, and $25 Priority Seating. Due to some violence and mature themes, parental discretion is advised. Balcony seating is not wheelchair accessible. For accessible seating, please call the CFCArts Box Office at 407-937-1800 x 710. Children ages 3 and under will be admitted for free. For those parents wishing for their 3 and under child to have his/her own seat, a free ticket will be available for reservation. Doors will open at approximately 7 p.m. Nature’s Table Cafe will be open at 5:30 p.m. both evenings – come early and join us for dinner! February 8, 2018 at 7:30 p.m.
February 9, 2018 at 7:30 p.m.